Danica Patrick is hitting the brakes on her career and retiring at age 36. She is, unquestionably, the queen of speed and this weekend, Danica Patrick is hitting the brakes on her career. The auto racing pioneer will officially retire Sunday at age 36. Patrick, the most storied woman in America’s motorsports history, will take the wheel at the Indianapolis 500 for her last ever race, bringing her career full circle. “It all started with her first Indy 500 as rookie. She won Rookie of the Year that year in 2005. She led 19 laps, she finished in the top five. And that was the start of the phenomenon known as 'Danica Mania.' And that’s when she became a household name,” said ESPN’s Hannah Storm, who has long followed Patrick’s career. (GoDaddy/YouTube) Professional race car driver Danica Patrick appears in a Super Bowl commercial for internet company GoDaddy in 2009. Earning a total of $10.3 million last year, Patrick is NASCAR’s eighth highest paid driver, according to Forbes. She has also been a favorite of marketers with major endorsement deals from the likes of Coca-Cola, Tissot, Hot Wheels and even OPI nail polish. Patrick also appeared in over a dozen, sometimes risqué, Super Bowl commercials for GoDaddy, her longtime sponsor for whom she wears bright green. Patrick’s racing career began on the go-kart tracks in Roscoe, Illinois, when she was just 10 years old. She dropped out of high school when she was 16 years old to pursue racecar driving in England. Three years later, she moved back to the U.S. and worked her way up to the IndyCar and NASCAR circuits. (Jonathan Ferrey/Getty Images) Danica Patrick poses with the trophy after winning the IndyCar Series Bridgestone Indy Japan 300 Mile on April 20, 2008 at Twin Ring Motegi in Motegi, Japan. With nearly 400 races under her belt, including seven podium finishes and five pole-position wins, Patrick has only won one race -- the Indy Japan 300 in 2008. Patrick said she is unfazed by the criticism about her record, saying she’s heard it her entire life. “Well, I seemed to be good enough for 27 years. So, that seemed to work out fine. Wasn't really a flash in the pan,” she said. (Jonathan Ferrey/Getty Images) Danica Patrick wipes her face during a press conference announcing her retirement from full-time racing at Homestead-Miami Speedway on Nov. 17, 2017 in Homestead, Fla. Her retirement announcement, which she made last November, was a rare emotional moment for the racer who usually looks so stoic. Dubbed the “Danica Double,” Patrick announced that her final races would be the Daytona 500 and Indy 500. GoDaddy returned to sponsor her for the first time since 2015. “I remember when I came here for the first time last year for the first time when we were kind of figuring everything out for these, for the Danica Double and I came in here and I was like, it just felt good. I didn’t recognize who was sitting there or anything but like, I’m back! And I expected it to be like home, and someone was like 'What’s your name?' And I was like. 'Oh, I’ve been gone too long,'” she said in her office at GoDaddy. (AJ Mast/AP) Danica Patrick walks to her car before the start of the final practice session for the IndyCar Indianapolis 500 auto race at Indianapolis Motor Speedway, in Indianapolis, May 25, 2018. But in February, her final spin at Daytona ended with a crash and she came in 35th place. 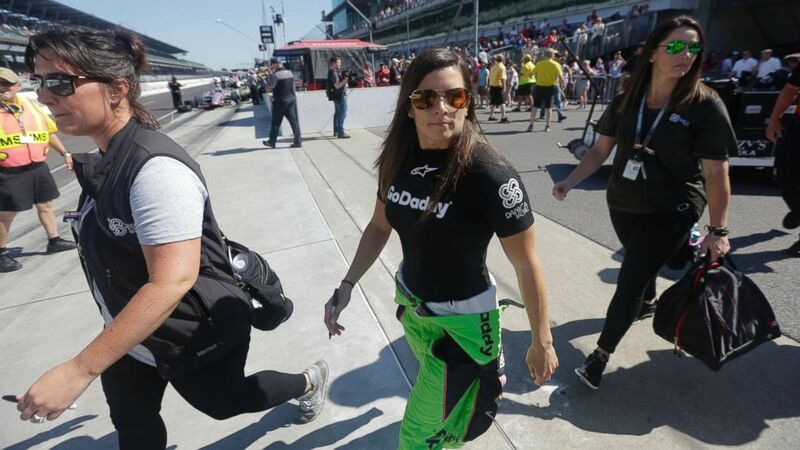 At the Indy 500, for which she qualified last weekend, Patrick will be going in seventh position with a four-lap average of 228 miles per hour. After retirement, Patrick plans on devoting her time to focus on growing her clothing line “Warrior” and her wine label, Somnium. A health fanatic, Patrick regularly posts yoga poses on Instagram and has also authored “Pretty Intense,” a health and wellness book which includes a plan for healthier mind, body and food. After her final lap Sunday, Patrick will be breaking another barrier in the sporting world -- she will become the first woman to host the annual ESPYs.